Jammu Kashmir is a state in northern India. It is located primarily in the Himalayan Mountains, and shares a border with the states of Himachal Pradesh and Punjab to the south. The state has special autonomy under Article 370 of the Constitution of India. It is the first state of India which has its own flag and constitution. It became part of Indian Territory when its ruler maharaja Hari Singh accepted the sovereignty of India on 26 Oct, 1947. Jammu & Kashmir is a state in northern India. It is located primarily in the Himalayan Mountains, and shares a border with the states of Himachal Pradesh and Punjab to the south. The state has special autonomy under Article 370 of the Constitution of India. It is the first state of India which has its own flag and constitution. It became part of Indian Territory when its ruler maharaja Hari Singh accepted the sovereignty of India on 26 Oct, 1947. J&K is best known for Horticulture products, Temperate Fruits, Apple, Peach Plum, Cherry, Almond Etc. Apharwat Peak (Gulmarg), Shankaracharya Hill (Srinagar), Dal Lake (Srinagar), Gulmarg Gondola (Gulmarg), Indira Gandhi Tulip Garden (Srinagar), Nigeen Lake (Srinagar), Mughal Gardens (Srinagar), Amarnath Cave (Anantnag), Zojila Pass (Sonamarg),Gulmarg Alpine Guides (Gulmarg). 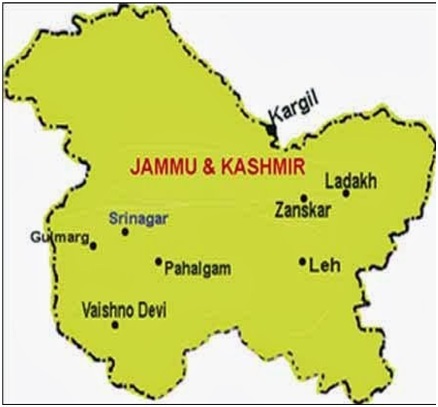 Read more:importance of Jammu & Kashmir in India , information , data on the economy of Jammu & Kashmir , dances of Jammu & Kas geographical features of Jammu and Kashmir , geography of Jammu and Kashmir , Kashmir dressing features , topography of Jammu and Kashmir , kashmir valley geography. Next Story Himachal at a Glance: "Snow-laden Region"